The lovely adobe church in Las Trampas is one of my favorite northern New Mexico subjects, rivaling famous Ranchos Church in Taos in form and expression. Called San Jose de Gracia the church was built in the early 1700s to serve the faithful along the High Road between Penasco and Chimayo. 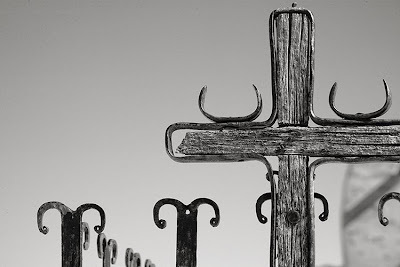 Within the church's courtyard is a tiny graveyard with ornate crosses of crude wood and wrought iron.